I have to confess that I never really liked mushrooms, especially those usually called ‘Chinese mushrooms’, which have a ‘thick’ and a bit ‘meaty’ texture. Well, it is probably because in Chinese cuisine, this kind of mushrooms are always cooked with meat; for example, the most famous such dishes is ‘mushroom and chicken’ pot, which is supposed to be very healthy, and help with body recovering, especially for women after giving birth. But, I never liked meat that much, especially chicken, so I always tried to keep mushrooms away. So really, it is not that I cannot eat mushrooms or don’t like them at all; it is more because of the combination with meat. But, I honestly did not know any Chinese mushroom recipes without meat. About three years ago, when we went back to China, in a ‘fast food’ chain restaurant, we ordered a mushroom vegetarian dish – it was impressively good, especially for a ‘fast food’ stand. Since then I have been trying several different mushroom recipes without meat. Hey, you know, I actually really like mushrooms now. In Chinese cuisine, there are too many different types of mushrooms, I could not even name them all. And sometimes they don’t really look like ‘mushrooms’， for example, shimeji (Cha Shu Gu), black fungus (mu’er), white fungus (yin er), enokitake (jin zhen mo)，hericium erinaceus (Hou tou gu). 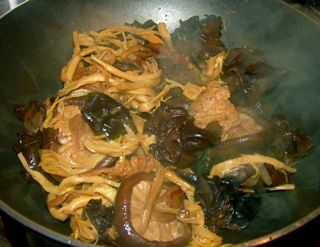 In northern Chinese cuisine, mushrooms are very popular ingredients, especially during winter. ‘Da xing an ling’ (the famous mountain crossing the three northeast Chinese provinces) is famous for producing many different types and high quality mushrooms. Most of them are sold dry in the market, and they need to be soaked well before cooking. The dish I had was a mixed mushrooms recipe. If I don’t remember wrong, there were about 5 or 6 types of mushrooms in the dish. 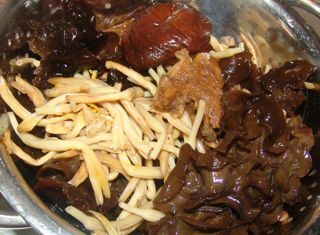 So, for making this dish, I just gathered whatever mushrooms I could get, Chinese mushroom, and black fungus (mu’er). And in addition, I combined them with another ingredient, Dry day lily (which we call ‘the food from yellow flowers’). Somehow I like to think it is a kind of mushroom as well; in fact, in northern cuisine, it is normally cooked as mushroom. Anyway, in the end, this proved as a good combination in terms of taste and texture. Concerning the benefits of eating mushrooms, I probably don’t have to say much. Different types of mushrooms contain slightly different nutrients, and in Chinese medicine, different mushrooms are used to treat different problems. I will say more in future posts. What I want to say is that having mushrooms in autumn is a very good healthy recipe (Yang sheng cai), since autumn is the best season for ‘nourishing Yin benefiting lung’, also in order to ease some common symptoms in autumn caused by weather change, for example, dry mouth, dry skin, coughing, we need to take lots of seasonal vegetables and fruits. Edible fungi have lots of protein and amino acids, way more than normal vegetables and fruits. So this recipe is an ideal autumn healthy recipe. It is really easy to make, the only thing you need to do a bit ‘extra’ is to soak the mushroom and dry day lily and remove the hard parts on them if there are any. 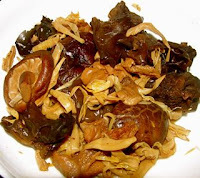 However, the ingredients can be quite flexible, I only used three different kinds of mushrooms for this recipe, but others, for example, button mushroom, oyster mushroom are also good for this recipe. Oil, garlic, ginger, salt, soy sauce, cooking wine, MSG/vegetable/mushroom/chicken essence (optional), ground sichuan peppercorn, five spicy powder. 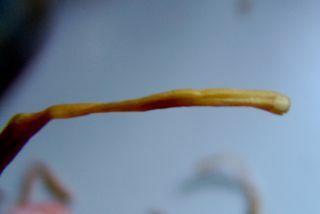 1) Soak the main ingredients in warm water for couple of hours or until they are soften, and removing the ‘hard’ part on the stem in dry day lily/golden needles vegetable (huang hua cai). Wash all the mushrooms and drain well. 2) Chop 3-4 gloves of garlic, and a good portion of ginger. 1) In a heated wok, pour in around 3 tablespoons of oil. 2) When oil is hot, add in chopped garlic and ginger, and 1/2 teaspoon of ground sichuan peppercorn. 3) When the smell of the garlic and ginger is raised, add in prepared main ingredients, and stir well. 4) Add in 1 tablespoon of cooking wine, 1 teaspoon of salt, 2 tablespoon of soy sauce, 1/2 teaspoon of five spicy powder. Mix well with all the ingredients. 5) Add in about 1 cup of water, lower down the fire, let it keep on cooking for further 5 minutes. I like to have it with plain boiled rice, so the taste of mushroom is not disturbed by others. Also the other dishes on the table should be lighter in taste, simple light meat dish is a good combination. Wash all the mushrooms and drain well. Chop 3-4 gloves of garlic, and a good portion of ginger. 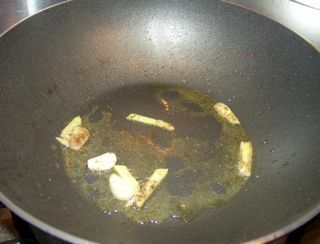 In a heated wok, pour in around 3 tablespoons of oil. When oil is hot, add in chopped garlic and ginger, and ½ teaspoon of ground sichuan peppercorn. Add in prepared main ingredients, and stir well. Add in 1 tablespoon of cooking wine, 1 teaspoon of salt, 2 tablespoon of soy sauce, ½ teaspoon of five spicy powder. Mix well with all the ingredients. Add 1 cup of water, lower down the fire, let it keep on cooking for further 5 minutes.